In AY 2018-19 only resident Indians with income less than Rs 50 Lakhs and one house property can file returns using ITR 1. NRIs are NO more eligible to use ITR 1. They would need to use ITR 2 which requires much more details and much more complicated compared to ITR 1. In case of non-residents, the requirement of furnishing details of any one foreign Bank Account has been provided for the purpose of credit of refund. Earlier, they could only provide details of bank accounts held in India. The ITR forms now ask for more details regarding the salary structure such as Allowances not exempt, Value of perquisites, Profit in lieu of salary & Deductions u/s 16. These details are available in Form 16 but now need to be provided in the tax return form too. The new ITR 1 (Sahaj) also asks for more details on “Income from House Property” such as Gross rent received, Tax paid to local authorities, Interest payable on borrowed capital. 1. 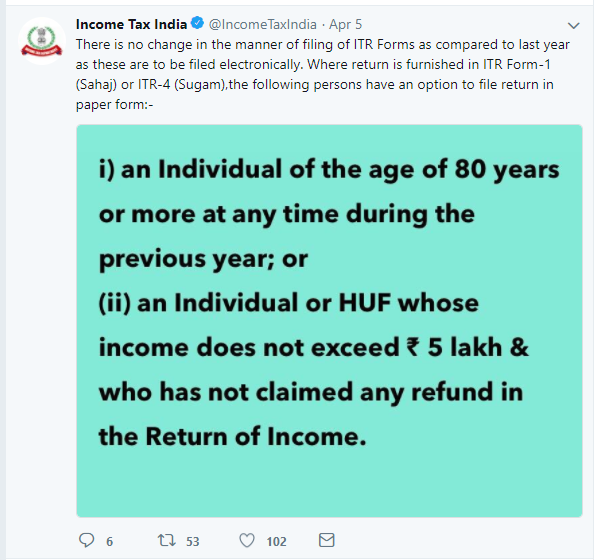 Which ITR form to fill for Tax Returns for AY 2018-19? 3. How to Claim Tax Exemptions while filing ITR? The assesses who would file income tax returns presumptive income from business and profession using ITR 4 or ITR 3 would have to provide GST registration number and its turnover. This is to corelate the direct and indirect taxes and check for any possible tax evasions. Last year ITR forms had fields to capture details of cash deposited during the year (due to demonetization). This years ITR Form has done away with this requirement. Who can file Tax Returns in Physical Form? As per Section 234F, if the income tax return is filed after the due date (July 31) but on or before the December 31 of the assessment year, there will be a fine of Rs 5,000. If the return is filed after December 31, there would be fine of Rs 10,000. After March 31, the returns cannot be filed. However, in case the total income is less than Rs 5 lakh, the penalty should not exceed Rs 1,000. We would come out with more details on ITR Forms and tax filing in next few weeks. I am a senior citizen. Can I claim deduction U/S 80TTB (upto Rs.50000) for the FY 2018-19 on my SAVINGS BANK INTEREST? My wife used to take private home tuition and used to file itr3 every year though her Total Income from all sources never crossed basic exemption limit. Now that due to poor health condition she has left her profession more than one and a half years back and she does not have any income other than a meagre amount of S.B. Interest much below Rs. 10000 a year……does she still need to file any ITR? 2017-18 i worked abroad more than 7 month but due to delay payment i received by salary in april-may 2018. not i am confused if i give bank details there will be no much translation from abroad within the period of april 2017 to march 2018. so how can i show my income in assessment year 2018-19. My husband is in USA and has filed USA joint return as a resident (USA) and declared me as a resident too. I stayed in India for 4 months. As per my understanding, in that case my status in India is NRI. I am unemployed in USA and I resigned from my India job in September 2017. Kindly let me know if I need to use ITR I or ITR 2. Being NRI, I am filling ITR2, as I have salary income for 3 months in india. Do I need to give details of income from outside india and tax relief ? or it is only required for them who are resident but has global income ? Being NRI which ITR forms needs to fill this time? If there is NO income in India you are not required to file ITR. However if you plan to do then you have to fill up ITR 2. When to use section 10(12) and section 10(15) in ITR 1 for declaring exempt income.? To furnish the exempted income in ITR – 1, which of below section 10 is to be used for “PPF Interest” to be selected. I used to take Home Tuition and filed my itr 3 upto AY 2017-18 as “profession (others”) SHOWING PROFIT AND LOSS A/C and maintained a book of A/C . Since last more than 1 and half years I have left my profession due to failing health and I have no sources of income other than a meagre amount of S/B interest <10000. Shall I have to continue submitting itr anymore? If yes , may I submit itr 1 to show the Income from S/B interest only? How to inform the Income Tax dept. if I want to discontinue submitting ITR further? In ITR1, the field ‘Type of House Property’ is mandatory. So if a salaried assesse don’t have any house property then what he should select?? In the ITR 2 for the AY 2018-19 for NRI it is indeed welcome the the Tax Dept has allowed to get refund if any into the foreign bank account. Please advise whether an NRI has the option to give local bank account for refund. (or) NRI has to give only a foreign bank account for claiming refund. The reason being if the refund is in foreign currency, there could be loss of exchange rate , transfer charges , time delays etc etc..